Featuring: Jimmy Stewart, Marlene Dietrich. Director: George Marshall. Warning: This movie is only supposed to be available for streaming until Dec. 25th. Act fast! I've always associated the holidays with Jimmy Stewart. His charm, the peculiar way in which he talks and the morally upstanding, but mischievous characters he plays, give me the warm and fuzzy feeling I crave in between thanksgiving and new years day. Before I decided to watch It's a Wonderful Life for the millionth time, I thought I'd see what else ol' Jimmy had on Netflix. 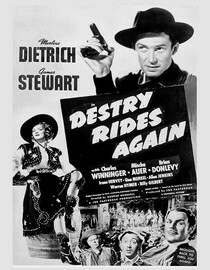 I came across a few movies and the one I decided to watch first was Destry Rides Again. I picked this one mostly because I had no idea how the hell a guy like Jimmy Stewart would fit into a western genre known more for violence and rough characters than that aw-shucks charm Mr. Stewart is famous for. Throw the always intriguing Marlene Dietrich into the mix and I just couldn't resist. This movie wasn't at all what I expected when I turned it on, but after watching it, I thought that it was exactly what I should have expected. Jimmy Stewart fit in the way he always fits in, with that unique force of nature he seems to possess. Having Marlene Dietrich playing opposite of him made this movie quite the treat. She played a wild and sometimes venomous woman that was always interesting when on screen and her chemistry with Stewart was wonderful. Stewart played a sort of pacifist sheriff out to bring law and order to a wild west town. The premise is a little silly, but the performances of Dietrich and Stewart make the end product wonderful. If you like westerns, and/or Stewart and Dietrich, queue this one up immediately. According to Netflix this movie will stop streaming on 12/25/11. Of course, sometimes they lie. Why is it in your queue? I just couldn't imagine what Jimmy Stewart would be like in a western. Is it artsy? No, its good raunchy (for the time) fun. What stood out the most to you? How wild Marlene Dietrich could be. What mood should I be in to watch this movie? In the mood to watch an old movie that will make you laugh.